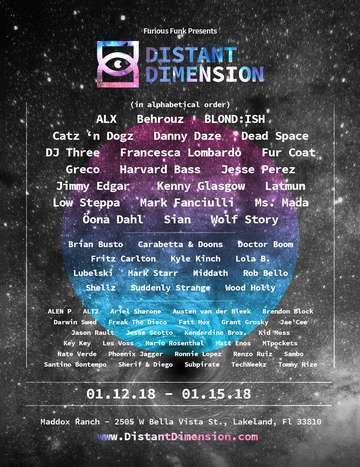 Distant Dimension is 3-day music and camping festival held at Maddox Ranch in Lakeland, Fl. The festival showcases many of the biggest house music artists from across the globe. This 1st annual event is hosted by Furious Funk, a Tampa-based record label that is focused on tech house and journeys into shades of deep house and techno. Upon entry, festival goers are transported into a distant dimension filled with whimsical, bohemian charm, booming house beats, and a culture that is built on love and unity. Must be 21 years or older to attend. Rain or Shine. All sales are final! Lineup subject to change without notice. Single day (non-camping) tickets are valid from 10 AM to 11 PM each day they were purchased for. Please review the FAQ section on our site http://distantdimension.com/ if have any questions prior to purchasing your ticket.